Ed (left) and Todd Park are trying to building another major player in the health care field. 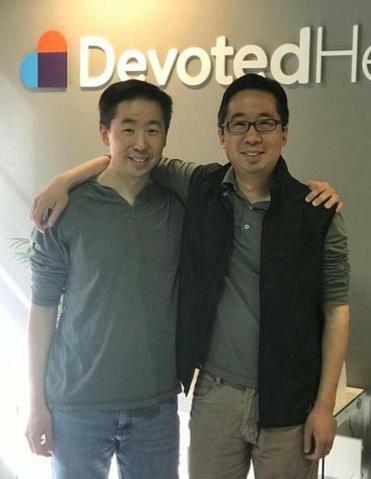 Two decades ago, Ed and Todd Park were part of the small team that launched athenahealth, the health care information technology company that grew into a big name in Boston’s tech economy. Now, they’re on their way to building another major player in the field. Waltham-based Devoted Health, led by the Park brothers, is trying build a better health plan for seniors by providing both the health coverage and the care — and using advanced technology tools to coordinate it all. The company on Tuesday announced a massive, $300 million capital infusion led by Andreessen Horowitz, the Silicon Valley venture giant that backed Facebook, Airbnb, and Twitter. The company said the money, which comes on top of about $70 million it had raised previously, willfuel an expansion at its offices in the Waltham Watch Factory, where its staff will grow from about 100 to 350. The company has begun offering coverage in Florida through the federally supported Medicare Advantage program,Medicare’s private insurance option. Medicare Advantage plans typically cover a broader array of services than general Medicare coverage, usually in exchange for a narrower provider network. The government pays a fixed amount per patient to companies that offer Medicare Advantage plans, which make money if they can keep costs down and patient outcomes up. “We are completely and wholly incentivized to focus on your long-term care,” said DJ Patil, Devoted’s head of technology and a former White House data scientist under the Obama administration. Devoted said it is building technology that can help its health care providers be more attentive to the needs of patients, including tools that help providers work together when a patient needs many services. The company’s network will be made up of independent medical practices that have contracted to be part of its plan and use its technology. Devoted is also hiring its own medical staff, including nurses and home care professionals, to work with the doctors. “Devoted Health will provide dedicated guides to help members navigate the health care system and will deliver tech-enabled Devoted care services to the home, including clinician house-calls for patients who are sickest and most at risk,” the company said. The company’s deep connections with Watertown-based athenahealth begin with chief executive Ed Park, who was chief software architect in athenahealth’s early days. He later became chief operating officer, and remains on the board of directors. Todd Park, executive chairman of Devoted, was a cofounder of athenahealth and remained with the company until 2009, when he left to join the Obama administration as a technology adviser. Venture capitalist Bryan Roberts of Venrock, who is founding investor of Devoted, was also an early investor in athenahealth. While Devoted is on the ascent, athenahealth, which makes electronic records systems and other tools to help doctors more efficiently manage their practices, is confronting a period of uncertainty. The company put itself up for sale recently following a lengthy dispute with an activist investor, Elliott Management, pushing for better stock performance. Jonathan Bush, the chief executive who cofounded athenahealth with Todd Park, departed in June. In an online post discussing the new investment, Ed Park said he believes Devoted will be a vehicle for big changes in the health care industry.